“After the magnificence of the first part, the attention is focused on the grandiosity of the RAI National Symphony Orchestra engaged in the two suites excerpts from the ballet “El sombrero de tres picos”. On the podium, Enrico Fagone, who in the concert of Liszt let himself be guided by Martha Argerich following any agogic and dynamic request, in the captivating work of De Falla, suspended between the folkloristic experience Albéniz and Granados and the impressionist influence of Debussy, shows a real narrative awareness in which the choreographic element of the latin score is enhanced without falling in to the easy absorption of the musical language. In this kaleidoscopic work made of luminous colors and irresistible rhythmic constructions, the opulent tonal spectrum of the NSO Rai stands out thanks to the carefulness gave to the melt of the sound and all the instrumental details, evident in the wind instruments during every dances that shows the theatrical meaning of the ballet. The final jota is a spectacular Iberian impulse animated by an overpowering symphonic load, expanding through a crescendo in which a multitude of orchestral effects – all well distinguishable – flows and which leads to an overwhelming explosion. In the 2018-19 season of the RAI National Orchestra the spotlights converge, beyond any doubt, towards the evenings dedicated to Martha Argerich with the participation of Enrico Fagone on the podium. It only takes a few notes to be fascinated by the sound of the doublebass,especially when there is a soloist like Enrico Fagone, who performed yesterday evening in Lugano. Fagone demonstrated a great easiness in playing,but most of all a wonderful virtuosity in his execution of the second concerto of Giovanni Bottessini with the ‘Orchestra della Svizzera Italiana’,under the baton of Juraj Valcuha,the permanent conductor of the RAI orchestra in Turin. For the second half of the programme,Enrico Fagone arrived on stage.I have already said it: he is one of the greatest double bass players in the world, and the fact that he has had a musical courtship with Martha Argerich for years proves my point. Fagone took on the tremendously difficult Granduo di Bottesini and did so with great expressiveness and musical direction.It was a triumph and everyone was on their feet at the end of the concert. G.Bottesini composed a series of the most incredibly difficult work for his instrument to demonstrate his vast superiority to all of those around him. Today they remain a massive challenge, on that Enrico Fagone, principal double bass of the Orchestra della Svizzera Italiana, tackles head on, displaying an agility on the fingerboard that deals comfortably with the fiendishly difficult outer movements of the B minor Concerto. symbiosis between movement and sound. 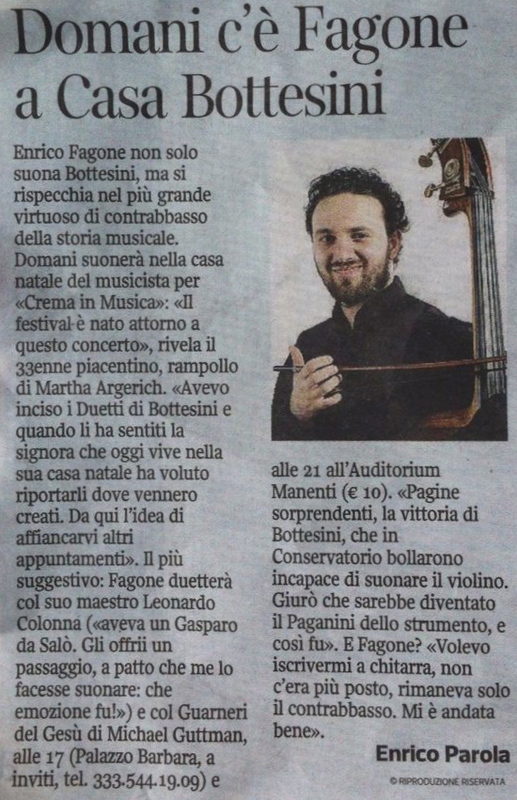 Tomorrow, Fagone will play at Bottesini House. Enrico Fagone will not only play Bottesini, but he will also bring to life the greates Double bass player in musical history. Sabrina Silan , "LIBERTA' PIACENZA"
At this point of the concert have been added to Martha Argerich and Nestor Marconi the three ambassadors of the Martha Argerich Presents Project including the amazing Italian bassist Enrico Fagone. I would like to express my satisfaction about Enrico Fagone and his extraordinary artistic personality, which makes him a prominent double-bass soloist! When one arrives at the end of the evening,a passionate diversion is needed and this was provided by the music of Koussevitzky and the soloist Enrico Fagone. Bent over his instrument,as if he were hugging it(stroking it,shaking it,consoling it) and kidnapped by the melody of the concerto for orchestra and double bass by Serge Koussevitzky(op.3)Fagone offers a demonstration of the quality of the double bass (with that sweet and intense sound).After the concerto,in a loud cry from the public,he engaged in an unchained and virtuosic rendition of a double piazzolla,dragging behind the audience and the public and transforming the stage into a stadium. The skilful performance had a worthy continuation with the execution of l‘Allegro moderato and l’Andante out of the double-bass concert of Bottesini and lo Scherzo for double-bass and piano by Van Goens. Fagone expresses all his passion through his alter ego, the double-bass: while he plays on stage, he seems to preach his love as an orator on a square or a lover under the window of his beloved. The pianist alternates rigorous and precisely a close dialogue with a more melancholic rhythm. There is a lot of harmony with his body language, the care for the last note, held by the hand till the end, and never completely left, it becomes almost a whisper. Simply said, it was an amazing concert. Every execution has been accompanied by the public with overwhelming applause, giving him at the end, a long and more than deserved ovation. For myself I was very pleased to see once again that the Benzi concourse two years ago had been right. I am determined to back this statement.. The second price in the String-players section of the International Concourse TIM (Torneo Internazionale Musicale) was assigned to double-bass player Enrico Fagone, already recognized among world’s most important double-bass players (Double-basses seldom manage to prevail in this competition open for all categories of string players. The double-bass player Enrico Fagone has become not just a simple rhythmic and harmonic support of the other three players, but has become a soloist role, giving new freshness and vitality to the entire group. Marco Buttafuoco, "GAZZETTA DI PARMA"
…and then the fantastic young double-bass player Enrico Fagone: with overbold spirit and lots of charm, the twenty-five year old enchanted the audience. You seldom see such a personality on our German stages. Temperament and creativity, qualities that Fagone noted significantly in the way, “sang” with its versatile Double bass, which seemed to approach the sweet voice of the cello. Poi, introdotta a sua volta da Borges con la voce Recitante di Paola Gassmanm arriva l’amatissima melodia Milonga del Angel di A.Piazzolla con il tema esposto al contrabbasso da un sensazionale Fagone. Fagone is a soloist of the highest order, yet he never lets the virtuosity of the solo part detract from the operatic; this is an emotive performance where the bass line never loses its inherent drama, so that when he lets fly with sixteenths passage leading to the firs movement cadenza, it’s an electrifying surge. With “Lo Scherzo” by Daniel Van Goens, Fagone has clearly demonstrated that even the most virtuosic songs can be executed by the double-bass.” This piece was actually written for cello and piano, but Fagone performed it through the double-bass. If even for the cellists, the song has a diabolical almost unworkable virtuosity, double-bass players are put enormously to the test: even a trivial interval on the double-bass is similar to a leap into the dark. This diabolical Scherzo (joke), seems to be nothing more then a simple finger stretch exercise for Fagone. The Italian double-bass player Henry Fagone has been awarded the 2nd prize for the String-players section during the TIM festival Torneo Internazionale Musicale.) Fagone expressed himself with a magical timbre, emotion and a sensational technique.